Philippe Grandjean | type eh? 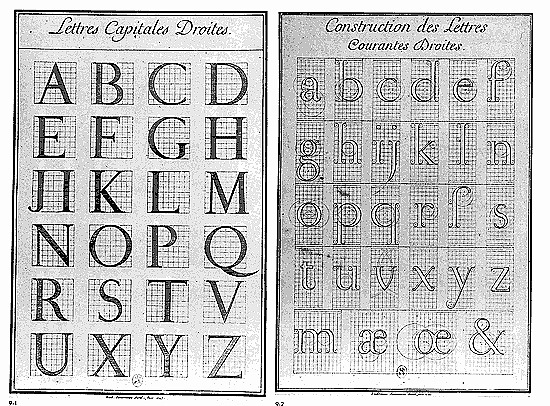 Just before the end of the 16th century, some 250 years after Gutenberg’s types, the French king, Louis XIV, ordered the Academy of Sciences to create the perfect typeface. This new design would be for the exclusive use of the French Royal Printing House set up by Cardinal Richelieu in 1639. To achieve the perfect design, a committee of academics, including a mathematician, devised a grid of 2,000 squares within which the alphabet would be designed. 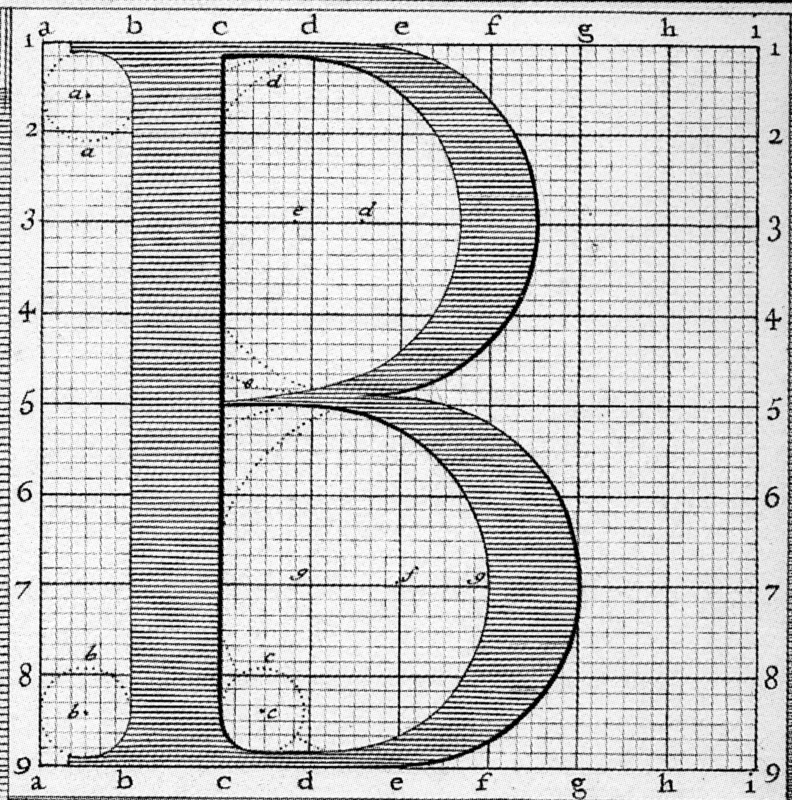 The job of cutting the type was given to Philippe Grandjean. It seems likely that this typeface was the first to be designed in such a logical, structured manner. The design, in 21 sizes including italics, took until 1745, 30 years after Grandjean’s death. The typeface was named Romain du Roi and Firmin Didot undoubtedly was inspired by the design. His own experiments with type, the ultimate result of which, along with Bodoni, are the models of Modern typefaces, and also are based on solid mathematical construction. 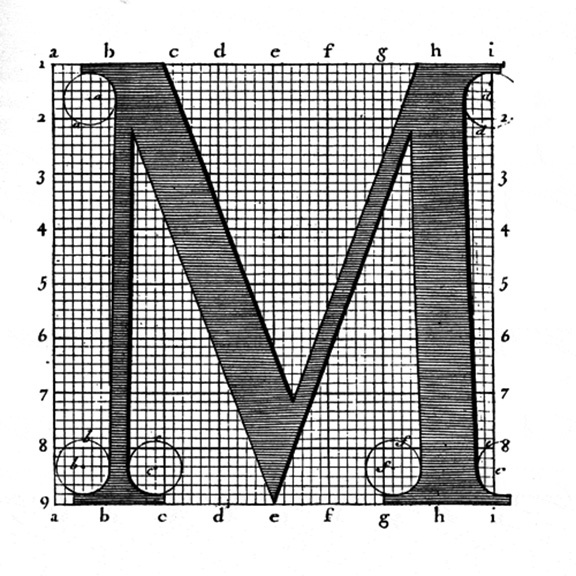 Above is the letter M as it was planned, shown within the mathematical grid. You can clearly observe the construction of the serif brackets, based on the arc of a circle six squares in diameter. 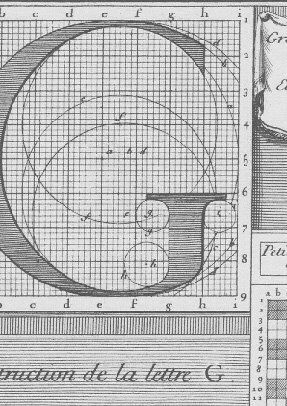 It seems unlikely that at small sizes the punchcutter could have mapped out the typeface on a 2,000 square grid, and I’m sure the art of the punchcutter is at play, rather than the grid. The result is undoubtedly magnificent. Here are some other representations of the typeface.